Ok so I’ll admit that being born in 1977 meant that I was a tiny bit late to the Evel Knievel party, as Knievel performed his last jump in 1975. However, I had an older brother by 7 years who lived for Evel Knievel and had all the toys. Early on we didn’t have much money and toys were one luxury that got passed down from my brother to me. I guess by the time I was ready to play with toys, he’d lost interest in the ones he’d had for a long time. 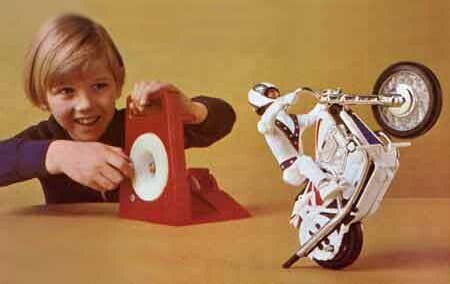 As such my earliest recollections of playing with a toy were with the now infamous Evel Knievel Stunt Cycle – a toy with its rear wheel connected to an “energiser” (a box with a flywheel powered by turning a handle). The occasional scraping of knuckles at this energising stage was compensated for by a joyous surge. In the few seconds of motion a diminutive, plastic Evel Knievel could be sent flying across our lounge, up and over the coffee table with the aid of a makeshift ramp made of my dad’s books and LPs. As a child he had such a massive impact – I wanted to ‘be’ Evel Knievel even though he’d long since retired from doing shows, and in what was very much a pre-internet time, I devoured anything I could get my hands on that featured him. An American legend. Knievel’s internationally televised motorcycle jumps represent four of the twenty most-watched sports events in history. His achievements and failures, including his record 35 broken bones, earned him several entries in the Guinness Book of World Records. These are the titles by which millions of people around the world know Evel Knievel. So why would he be my champion of #restlessthinking? In this the first of our series of posts about icons of Restless Thinking, I chose Evel Knievel because of the impact he had on me as a child. I guess he’s my icon of Restless Thinking because of the nature of his craft. There was always something else to jump, always another feat of daring to do. It’s this drive that confirms his place as an icon of #restlessthinking. A master showman, Evel actually blagged his first major event by creating a fictitious corporation called Evel Knievel Enterprises and three fictitious lawyers to make phone calls to Jay Sarno the then CEO of Caesars Palace. Evel also pretended to be journalists for ABC and Sports Illustrated and called Sarno, asking for information on the Caesar’s Palace jump. Sarno, intrigued, agreed to meet Evel and arranged for Knievel to jump the fountains on December 31, 1967. After the deal was set, Knievel tried to get ABC to air the event live on Wide World of Sports. ABC declined, but said that if Knievel had the jump filmed and it was as spectacular as he said it would be, they would consider using it later. Knievel used his own money to have actor/director John Derek produce a film of the Caesars jump. The jump itself was a failure as Evel came up short, resulting in him landing on the safety ramp and crashing into the Caesars Palace carpark, where he crushed his pelvis and a femur, fractured his hip, wrist, and both ankles, and had a concussion that kept him in the hospital. The Caesars Palace crash was Knievel’s longest attempted motorcycle jump at 141 feet (43 m). After his crash and recovery, Knievel was more famous than ever and ABC-TV bought the rights to the film, paying far more than it originally would have had it televised the jump live. At Restless we’re constantly searching for what’s over the horizon, what will be the next transformative technology or idea. It’s this same drive that Evel had, forged from the appetites of an audience who are always looking for the next big thing that resonates with us. We share this drive with people like Evel and it forms the very basis of what we do and importantly, how we do it.